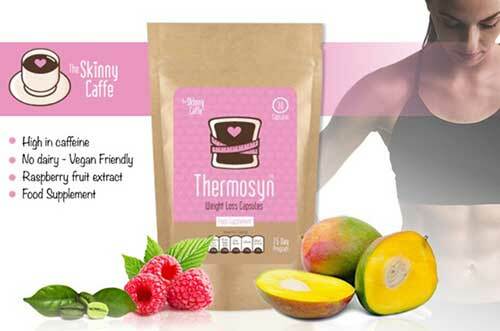 Themosyn weight loss capsules are a small part of a vast range of weight management products produced in the UK by The Skinny Caffe. Other items include weight loss teas and coffee, low-calorie pancake mixes and syrups, and a chocolate and hazelnut spread that is low in sugar. The extensive use of pink on the website suggests,The Skinny Caffe is a brand intended for women, but there is no reason any of the products should work any differently for women than they do for men. According to the marketing material, Thermosyn Weight Loss Capsules contain some of the most effective weight loss and energy-providing ingredients available and have the ability to “dramatically improve” fat burning capabilities while also delivering a “huge increase in explosive energy levels”. Remarkable results are promised to people who use the capsules in combination with a healthy balanced diet, but the way these results are intended to be brought about is not explained. Claims: Thermosyn Weight Loss Capsules contain ingredients that are known to suppress hunger and boost energy levels, thereby removing a lot of the misery from the weight loss process and providing an increased chance of success. Positives: Green coffee bean and capsicum have the potential to boost the metabolism and encourage fat burning, but the high iodine content may bring the metabolic rate back down. Negatives: In some cases the inclusion rates may be a little low. What Are Thermosyn Weight Loss Capsules and How Do They Work? Weight loss only occurs when the body becomes so starved of calories it’s forced to begin burning its fat to make up for the energy loss it is experiencing. This can be achieved naturally by using the combination of a low-calorie diet and exercise. The problem is, low-calorie dieting can result in feelings of hunger and cause diet-related fatigue. Thermosyn Weight Loss Capsules contain ingredients that are known to suppress hunger and boost energy levels, thereby removing a lot of the misery from the weight loss process and providing an increased chance of success. The pills also contain ingredients that can boost the metabolism and further encourage fat burning, but good results will require adequate inclusion rates and, in several cases, the inclusion rates are too low. Glucomannan (100mg): A very good appetite suppressing ingredient that is being scuppered here by a low inclusion rate. Glucomannan is a form of natural fibre extracted from the roots of a plant. When it is activated by water, it expands and makes the stomach feel full. Research proves its value, but the standard dose is 1g, taken three times per day before meals. The amount provided here is not enough to provide any tangible benefit at all. Caffeine (83.34mg): A stimulant that’s good for providing energy and sharpening mental focus. Caffeine is often included in diet pill formulations because it also boosts the metabolism and encourages thermogenic fat burning. The amount provided here is slightly less than that provided by a small cup of coffee. Acetyl-L-Carnitine (50mg): A compound of the amino acid L-Carnitine. It’s often added to muscle-building supplements and also aids energy production in the body. L-Tyrosine (50mg): Another amino acid used in bodybuilding formulations. Large doses can boost cognitive function. Research shows 10g per day can work well, but the amount provided here will not even scratch the surface. Raspberry Fruit Extract (500mg): Raspberry ketones has value both as an appetite suppressant and a fat burner, but standard raspberry fruit extract will offer no benefits at all. A full kilogram of raspberries only provides one to four milligrams of raspberry ketones. Green Coffee Bean (1000mg): The chlorogenic acid that is naturally-occurring in green coffee beans boosts fat burning capabilities and further contributes to weight loss by helping to prevent the post-eating insulin surges that cause the blood sugar level to crash, thereby triggering urges for high-calorie food. The amount provided here is borderline acceptable, but only if the extract provides at least 10% chlorogenic acid. The Skinny Caffe fails to disclose the potency of the extract they have chosen to use. African Mango (250mg): A tropical fruit extract that suppresses hunger. The ingredient is also known to be unusually high in nutrients and is generally considered very good for the health. Capsicum (100mg): A red pepper extract that supports weight loss by boosting the metabolism and encouraging the body to lose extra calories as heat (thermogenic fat burning). Bladderwrack Extract (175mg): A seaweed extract that provides Iodine. The thyroid gland used iodine to produce hormones that are necessary for an efficient metabolism. The Bladderwrack extract used here has been standardized to contain 1% iodine. That means each capsule provide 1.75mg of iodine. Doses that exceed 0.15 mg (150 μg) per day are not needed and doses that exceed 0.5mg (500 μg) per day can suppress production of thyroid hormones T3 and T4 and may cause other health consequences. Chromium as Picolinate (66.67mcg): Like chlorogenic acid, chromium prevents the insulin surges that can lead to desires for high-calorie food. Usage Instructions – One capsule is required two times per day and the doses should be separated by a gap of four to six hours. The Skinny Caffe state workouts are not necessary with this product but suggest users who do workout change the dose to two capsules, taken together, 45 minutes before exercise is commenced. 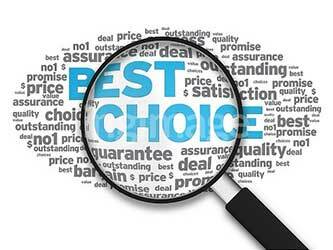 The manufacturer’s website provides a number of reviews that are attributed to satisfied customers and proclaim the product to be “excellent”, “super”, “fantastic”, and “great”. However, reviews obtained from such a biased source cannot be relied upon for accuracy. We searched for sources of independent reviews but were unable to find any. The formulation provides an unusually high dose of iodine, so this product should not be used without a doctor’s consent. 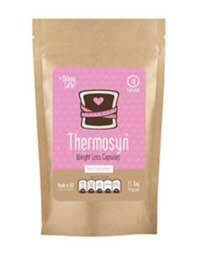 You can buy Thermosyn Weight Loss Capsules directly from the manufacturer’s website or from Amazon UK. The pills come packaged in rip-open bags instead of bottles and each bag contains a 15-day supply of pills. In theory, Thermosyn Weight Loss Capsules should be able to prevent sugar cravings, but the glucomannan inclusion rate is so pitiful the formulation will have to rely on African mango for hunger suppression and the dose provided may not be high enough in a formulation where it has to go it alone. The presence of caffeine and Acetyl-L-Carnitine will help provide an energy boost, but it unlikely to be as “huge” or “explosive” as the marketing material claims. Green coffee bean and capsicum have the potential to boost the metabolism and encourage fat burning, but the high iodine content may bring the metabolic rate back down. The high iodine content also increases the potential for side effects so, all things considered, Thermosyn Weight Loss Capsules do not compare well to some of the other options available.